Though my main mission was to attend Youth Connekt Africa Summit in Kigali, I had many other desires to see and experience about life in Rwanda, witness the progress the country has made after the horrific genocide, learn practical lessons from the process of peacebuilding and reconciliation and seek answers to a pool of questions that kept me curious for quite a number of years. Landing in Kigali at night gave me a glimpse of what the city was holding for me. A green, lush, clean and beautifully planned city with well-structured network of roads, buildings and general infrastructure was the first of many impressions. Excited and energetic, I had to wait a few more hours to see the day life of Kigali. Enough rest from the short but hectic journey was a priority for the rest of the night. In the next morning, I checked into the Kigali Convention Centre, the venue of the summit I came for, to grab my pass card and get as much information as possible about the summit. From 8th to 10th of October, I was fully committed to the summit, which brought together thousands of young and bright intellectuals from the whole African continent. In every country and in every region, there was a group of ambitious and talented youth representing their respective countries at this continental gathering. Somalia was greatly represented by a young, abled and dedicated team. The group of the Somali youth representatives at the summit, indeed, made me fully proud of my country than before. The greatest asset I have gained in the three days of the summit was that I established valuable networks and befriended the continent’s future leaders. Equally important was the experience and exposure I gained from the conference. Having real talks with youth from all of Africa, addressing the contemporary issues in the continent in friendly and amicable ways, sharing the many commonalities we have and how best it can be utilized, and sometimes exchanging jokes were among the fascinating topics and experiences I had in the three life-changing days of the Youth Connekt Africa Summit. After the summit, I have been left with only three days to stay around and experience life in Rwanda. Visiting Kigali Genocide Memorial Centre was on the top of my to-do list and it really produced a lifetime experience. It was a place I had wished to see for many years had the visit actually surpassed all my expectations. At its gate, I stood for a while to read the scripts around it before I was briefed of what to do and where to go next. As part of the orientation to the Centre, we watched a short documentary film which takes you through the background of the center. I did not just want to take pictures, but to learn how Rwanda moved on and peacefully lived after the genocide. This formed the core of my assignment of the three days left with me. 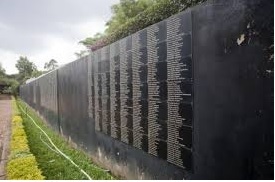 The Memorial is the final resting place of up to 250,000 victims of the genocide. As an honor to a million Rwandans slaughtered during the 100 days of bloodletting in 1994, the Centre visually equips you with a deep understanding of the causes of the massacre, how it happened and the aftermath. Historically, in the span of 100 days, 800,000 Tutsis and moderate Hutus were massacred by ethnic Hutu extremists in 1994. The genocide, which is regarded as a ‘tribal hatred gone terribly wrong” had many underlying causes. Some of these causes go back to the colonial structural divide of the Hutu and the Tutsi ethnic groups in which one group was favored over the other and the institutionalized, pervasive discrimination and segregation between the two communities. The colonial powers first gave the power to the minority Tutsis, making the majority Hutus feel undervalued and oppressed, but this was reversed when the independence approached with the majority Hutus getting the power and the opportunity to revenge. The Memorial clearly explained everything that led to the massacre, and I had the chance to go from one side to another. But, what I was curious about was not that history and background, but to know what the directions the country’s citizens have taken to make today’s Rwanda viable and functioning stable nation. Finding answers for my intriguing questions was paramount. I concluded: Rwandans have fostered a sense of shared identity and commonality, thereby eliminating the Hutu and Tutsi segmentation and ethnic identification—in short, being “Rwandans” was the core of identification. They achieved reconciliation thus having an inner peace within themselves. They symbolized forgiveness thus healing the country. They believed in women thus creating a non-violent atmosphere. They invested in youth thus utilizing the real potential. They promoted economic progress thus focusing on the future. And finally, this is what I have to say. Somalia can learn a lot from Rwanda as the two countries share many commonalities. Firstly, social re-engineering is the must path to reinvent the social fabrics by creating bigger pictures for those who are still captive to the myopic clan identification and rule. Secondly, forgiveness and peacebuilding efforts are the commitments needed to find a prosperous and cohesive Somalia. And thirdly, justice should be the way forward to serve as the healing process to this civil-war shattered society.